I must thank internet for giving me the opportunity of meeting virtual pen-friends, whom you feel you will never meet in your life even though you exchange lots of mails with them. I happened to change a virtual friend into a real one. And could you imagine where? In Tokyo. Here is a summary from my travel diary of my trip to Tokyo. I hope you find its detailed information interesting and captivating for a journey you might take there someday. Moreover, I could not draw it up without photos attached shot by my Japanese pen-friend from Tokyo and by me. First of all, many thanks to him for going along with me through Tokyo and for pointing out aspects of the daily life in that big metropolis. Afriend of his was with him and she helped me realize how life goes on in that city. Besides, I must address part of my memories to a local family, as it was thanks to strolling with them that I could visit a Shrine Nedujinja in a quarter north of Tokyo, which they had never seen until them either. And that was a discovery for them, too. They were very kind to me. This letter is not meant to be only a mere description of my trip. I am aware, however, that it is really impossible to convey emotions simply by words. I suppose you may be interested in knowing how I could have the chance to fly to Japan. Well, I am fond of travelling and off I go whenever the opportunity arises. My travel agent knows that I dream of living with a travelling bag in my hand and a knapsack over my shoulders. Thus when I was offered a cheap trip to Tokyo I accepted. The only rule is that you have to book only a few weeks before taking off; the number of seats available is extremely limited, but I was extremely lucky to find one!. There's a saying that reads. "Catch the train when it passes: You never know whether it will pass again". After 13 hours' flight I landed at Narita International Airport. Tokyo appeared to me as a boundless, endless, immense metropolis. What impressed me first was its cleanness everywhere, and everybody's kindness: from bartenders to ticket collectors in the underground, from local policemen to taxi drivers. At the same time, however, I was struck by the active bustling all around. As to my experience in the Underground, I can say that the trains are always crowded even late at night. And amid the crowd the deafening noise of advertisements welcomes you at any station and ghastly accompany you to the escalators where you are muffled up in a cloud of lulling, softly-recorded sound messages. Then you get caught in the deafening advertising jingling of shops, flashing beacons and automatic dispensers. Tokyo: is a city of contrasts; I myself saw an elegant lady in a kimono buying a hamburger and a Buddhist monk begging for alms in a crowded street in the elegant quarter of Ginza wearing a fashionable wrist watch. The Portuguese were the first Europeans to reach Japan in the 16th century. At that time Tokyo was a small fishing place called Edo. 500 years have elapsed since then. The early settlement on the Pacific Ocean has grown into a city with over 12,000,000 inhabitants. The Japanese pride is nature and a characteristic element that strikes any tourist soon after landing at the International Airport is the quantity of green plots and fabulous gardens well trimmed, and designed with artistic care. They look like gems cast between malls and fashionable, glittering shops. At first sight they look like wild little corners. But, as soon as you get nearer and nearer you realize that they are set according to a particular scheme. Even the tiniest ornament has its own place: a small piece of gravel could not be moved without changing the whole. Temples and shrines are also well kept and look delicious. Soon after my arrival I tried my way through little alleys in Bunkyo-Ku, a quarter (Ku in Japanese) lying north of Tokyo, as I wanted to see one of the most ancient cemeteries of old Edo. Then I went on to Nedujinja Shrine standing nearby. After that I paid a visit to the Samurai Museum and Tachihara Michizo Memorial Museum, some of the most breathtaking museums there. The local family helped me find my way in the Quarter. I must confess that it was a hard enterprise indeed. Downtown, squares, roads, streets, lanes bear no names or numbers, but you must know the names of the quarters. Nine of them are the central ones: Chiyoda-Ku housing the Imperial Palace and its parks. It was destroyed in 1944 during the wars, and rebuilt in the 60's in reinforced concrete, the House of Parliament (1918-1936) does not stand far from the Palace. It is the heart of Japanese politics. Another quarter is Chuo-Ku; it is close to the Stock Exchange - the financial centre - and the famous, elegant quarter called Ginza, which is the fashionable shopping centre of Tokyo, Minato-Ku is the quarter where you can taste "the future" when you are in front of the World's Trade Centre of Tokyo Tower (333m. high). Churches and temples are surrounded with splendid, lush parks. On the perfectly-run underground I travelled up and down Tokyo, stopping to visit temples. The one which impressed me most was one of the biggest called Senso-ji Temple in Asakusa, inside which you can see the golden image of Kannon, a goddess. There were a lot of worshipping people in it, and as it was a Sunday, many more were standing outside watching dancers and musicians performing on small squares and tiny streets near the temple. Just in front of it there stands a fountain for the purification of the worshippers there. A fire was burning nearby in a small building looking like a little shrine. That sight touched me deeply. Moreover, I was wrapped in an incense-smelling cloud of smoke coming from the incense sticks burning all around. The burning of devotional sticks is the third step taken after the purification rite and the saying of prayers in the temple. I felt myself trapped in the enchanting atmosphere as if I were one of the believers. 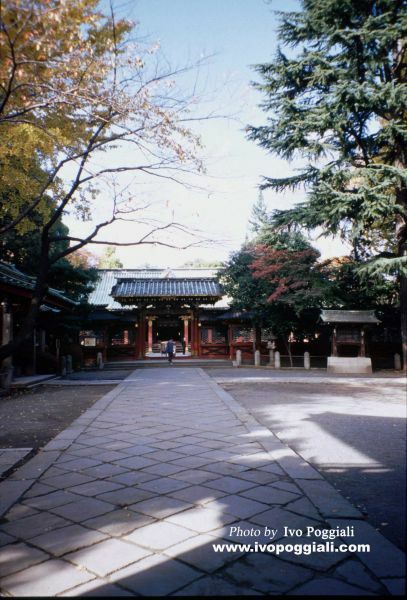 Within a short distance from the temple, there is a huge park called Ueno Park, where lots of people go at the weekends. It was crowded on that day, too, even though it was not sunny or glorious. Not far from UENO Park I could see the “Statue of a Samurai (Saigo Takamori) walking his dog”. I was curious about the symbol of the statuesque group and I looked in my paperback guide book for the explanation. So I read that the warrior and dog meant that a Samurai was not only a warrior, but a man with a homely life after his fights. Then I visited the Temple of Meiji-Jingu, which I reached after walking along a pathway adorned with fanciful lamps on either side, and passing below an imposing archway. An unnatural silence was hovering all around me. Just think that the place is in the heart of a very busy city. I was lucky enough to be there at the moment when a real Japanese-style wedding ceremony was being held. I'll never forget that sight: the bride's friends were all wearing their loose traditional robes fastened with a slash - kimonos as they are called - and the men, all in tails, were sitting in the middle of the temple. Men and women looked extremely elegant, and conveyed a touch of elegance to everything there. Unluckily, I could not visit the interior of the Imperial Palace, because of the “Rice Day”. Moreover, the day was not clear. You know the importance of a sunny day in an Eastern country. That very moment I said to myself that I would not miss it on a second visit some day. Apart from the temples, the palaces and the statues, my journey has enabled me to meet my pen-friend. We had made an appointment in the lounge of my hotel on Sunday at a fixed time. I must confess I was very excited as I had never met him before. What's more, I felt uncertain about how to start the conversation. It is not easy for me to describe the impressions overflowing my mind. Any young man getting in could be “him”; even anybody's gestures could reveal that it was my pen-pal. A photo may not be sufficient to recognise somebody unknown to you. Amid my whirling thoughts I heard my name called by a male voice followed by "Are you Ivo?". Emotion overcame my bosom. It was the first time I had met a pen friend. A short introduction and exchange of presents followed. No sooner had we made friends, we left the hotel and walked to an underground station for the quarter of Shibuya. I saw the human spectacle of young people get off and on the trains in clusters, change lines, stop, and talk. When we dropped at our destination it was evening. In between, I asked my friend whether that quarter was exclusive for people under 30. He smiled and explained to me that Shibuya is indeed the meeting point of young people. Actually, not far from there is the quarter of Roppongi where Tokyo lives her night life. At a kiosk we bought something to eat: a packet of nice boiled potato balls seasoned with Japanese sauce and herbs, called Takoyaky. We enjoyed the meal while strolling along overcrowded narrow alleys. Then by underground we went to a quarter called Shinjuku - just a glance at its fabulous lights and appearance. Then we parted and I went to Roppongi again by underground. I wanted to see The Tokyo Tower, a copy of Paris' Tour Eiffel though higher by 30 m. (333m altogether). I climbed to the terrace on the top floor and could enjoy the sight of Tokyo by night, brightly lit with numberless lights. Though I had planned my day and I was well aware I would be in front of views unknown to me, I would never expect that such a big wave of emotions would flood over my mind and heart. Darkness and night hide everything but when the dark is spotted with millions of incandescent bulbs you feel as if the world is fighting to assert its presence in spite of natural laws. When my emotions dissolved I started walking again for an hour or so, and I found myself amid the sparkling light of discos and night clubs through which people got in and out in a continuous flow. It was midnight. 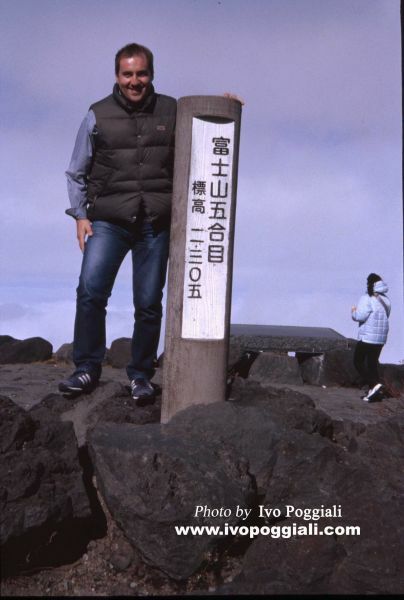 The next day, following my programme, I got up early for my trip to Mt Fuji, the highest mountain in Japan (3376 m.). 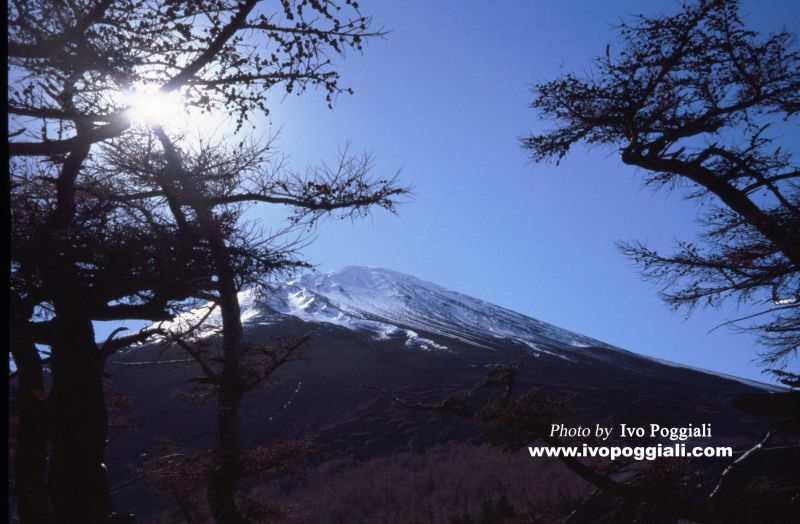 Its top was snow-capped, a bright sun was shining, and a cool wind blowing all around made the landscape clearer. It was the right atmosphere to take photos that might look like pictured postcards or make you re-consider the problems of naturalist painters as photographers of nature or photographers of natural scenes as naturalist painters. The endless problem! With my eyes full of this view I approached Lake Ashi. I think it is second to none, as to beauty, superior to the description I had read in my guide book, and one of the largest in Japan. It appeared to me as the vastest blue expanse of water I had ever seen. In front of it, Hakone, a large botanic garden, was breathtaking as well. Then I came down to the earth: it started drizzling, which caught me unexpectedly. It went on until I left for Italy. The weather proved to be really unpredictable. I spent the evening with two Italian people who had just arrived at the hotel from Italy. We soon made friends and after a short talk they asked me to take them around. So we walked to the quarter where I had been the night before. The next day was my last one in Tokyo; I decided to make the most of my time. I got up very early to see the famous Eastern Dawn. I hurried up to the terrace on the top floor of the hotel, which looks on the Ocean .It was still dark but a flick of sunshine appeared heralded by faintly - clearing vapours of lights in the sky. And this is how I saw the dawn in the East. I had read a lot about that fascinating natural phenomenon in Japan, but no report mentioned that dawn tinged the shimmering Ocean pink. I was in rapture, but conscious as well. I remember saying to myself never to forget that colourful scene. I hope I'll be able transfer it and my emotions into a canvas some day. I wish I could. At 6 a.m. it was full daylight. It was the right time to go and see the Tsukiji Central Fish Market. It was worth seeing it as it is the biggest in the world. 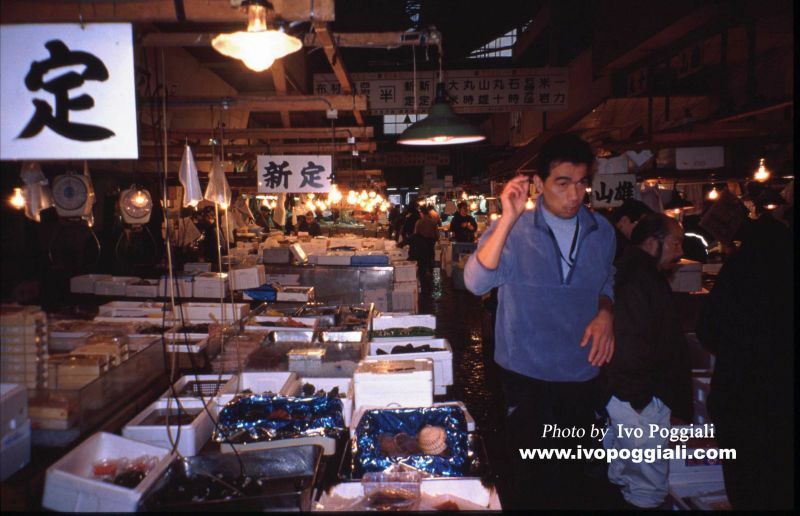 Tourists can be present when the auction of the fish fished night before is held. In the enormous market sheds facing the Ocean, any kind of sea creatures were displayed: heaps of octopuses, lines of giant tuna fish neatly and duly tagged with their buyers' names, molluscs of all sorts, cases of water with fish swimming inside, bagfuls of twisting crabs, while numberless boxes of fish were handed over by what appeared to be a busy, fast-running human chain. I had never seen so much fish in my life. Every morning wholesalers, representative agents, young businessmen interested in the buying and selling of fish go to pray in a shrine not distant from the market place, and mix up with common people praying there, too. The little temple is called Namiyoke-jinja. A big temple ,"the temple of Tsukiji-Hongan-ji", which stands not far from the shrine, looked surrealistically Indian, as if carried there by a magic powerful architect from India. That aroused my curiosity and I looked all around the Temple for an explanation. Actually, on one of the outer walls a plate explained that it was built after the Indian style to pay homage to the land of Buddhism. After leaving the place where I realized I had spent some hours gazing at everything there, I walked along a fashionable high street which would lead me to Shinjuku, a quarter just at the other end of the town, where I had the Good-Bye appointment with my Japanese friends. The weather had changed badly: it was raining in buckets. However, that did not prevent us from calling in malls and in a typical Japanese restaurant. We had lunch there. The waiters placed sauces delicately and accurately on a central dish, which made me feel a bit at a loss as I realized I was going to cope with table rites different from mine. I could not but ask my friends how to behave, with "Tempura" - the fish being served as main course - and with "Sakè", a drink known to me only by name. "Sakè" was served in a strange (to my eyes) but elegant dark pot which reminded me of the old Etruscan pots you can see in museums in Italy. We spent a pleasant time at table, talking about the day. As it was still pouring we agreed to our spending the remaining hours window gazing and strolling in the mall again. It was a sight to see the Christmas decorations adorning everything inside. Their brilliance was getting more and more vivid as if to fight the incoming night off. Street lights, too, appeared to join that completion by adding their phosphorescent lights in that struggle aiming to prevent the night from stepping in. When the daylight was completely out it was time for us to part. The futurable atmosphere of the blazing neon-lights in the underground station where we were standing for goodbyes reminded me of the film "Blade Runner" and its mega plasma screens. We hugged and kissed goodbye, exchanging the promise to meet again - only God knows where and when. We were all sincere at heart. I'll never forget that experience. I was aware that so many emotions and feelings had psychologically enlarged the time of my holiday: now I feel that I am richer within myself and that perhaps I better understand "The Other".